Chris Gleason knew his Wisconsin 2017 Teacher of the Year title would open some doors for him. Still, it was a little surreal when those open doors led him into the White House and the Oval Office. 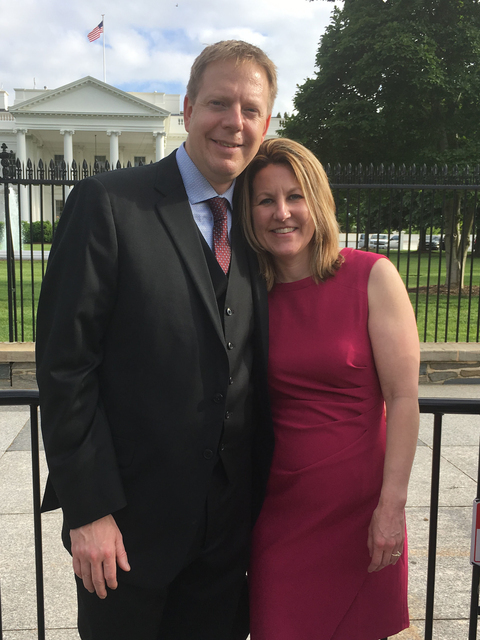 Chris and his wife, Erin, who also is a Blugold, spent several days in the nation's capital, where he met with various government leaders to advocate for teachers and education. 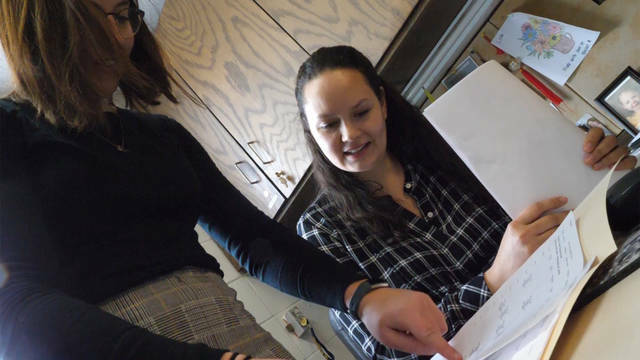 “It was an amazing opportunity to be in that space,” says Gleason, who was in Washington, D.C., for a Teacher of the Year celebration with all state winners. “After a ceremony and group photo, we each had individual pictures with the president and first lady. Gleason, who earned his music education degree from UW-Eau Claire in 1997, is the band director and instrumental music teacher at Patrick Marsh Middle School in Sun Prairie. In addition to the Wisconsin Teacher of the Year honor, he also was among four finalists for the National Teacher of the Year award, considered the most prestigious national honor that focuses on excellence in teaching. He is the first Wisconsin teacher in 50 years to be a finalist for the national award, which this year went to a teacher from Boston. Only one Wisconsin teacher — in 1961 — has won the top honor in the program’s 65-year history. The UW-Eau Claire graduate’s passion for teaching, and his talent for nurturing and inspiring his students in ways that help them use their gifts to excel in band and in life, earned him the Wisconsin Teacher of the Year honor and put him in the running for the national honor. Each spring, the state winners spend several days in Washington, D.C., where the president honors them, a gala at the famous Willard Hotel celebrates them, they share ideas and build connections during professional development activities, and they discuss education-related issues with a variety of government leaders. While his time with President Trump and Vice President Pence, who also was in the Oval Office to greet the teachers, was limited to the photo opportunity, Gleason says he made the most of his time in the nation’s capital by meeting face-to-face with as many government officials and their staffs as was possible. That afternoon, he and other state winners met with Education Secretary Betsy DeVos and her staff. His message to some of the nation’s most powerful government officials? 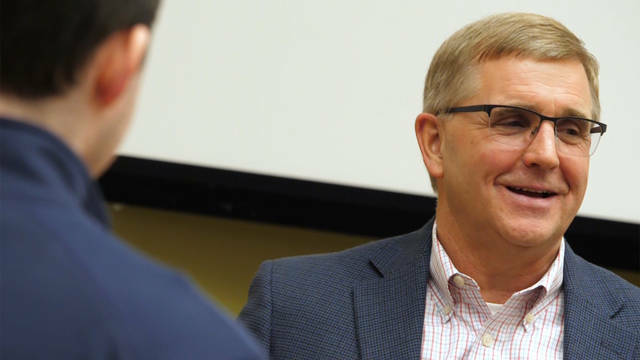 Those are the same messages he is sharing across Wisconsin as he meets with state education and governmental leaders, as well as with students who may be considering a career in teaching. 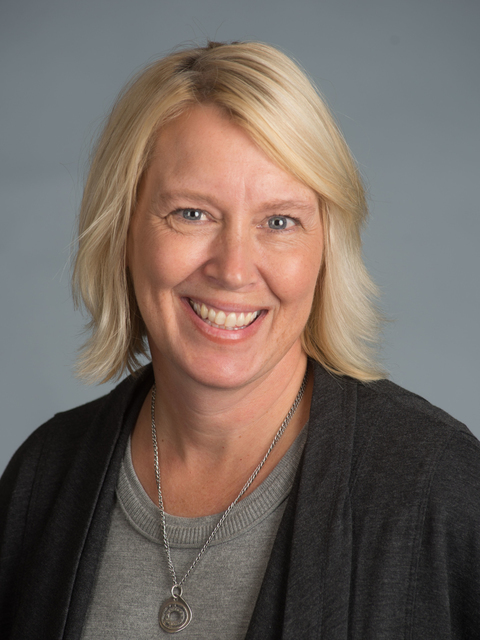 “As soon as we landed in Wisconsin, I was off to Green Bay to do a keynote at Lambeau Field for the ‘Every Teacher is a Leader’ summit,’” says Gleason, who also spoke at UW-Eau Claire as part of the College of Education and Human Sciences’ celebration of 100 years of excellence in teacher education. As the 2017 Wisconsin Teacher of the Year, Gleason will have more opportunities to share his messages as he travels the state and country talking about the teaching profession and his ideas for creating even better education experiences for students. 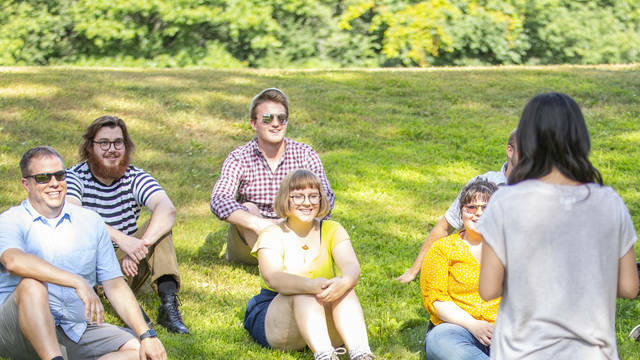 This summer, Gleason will teach workshops at several universities, and attend a national forum on education policy in San Diego and the Space Camp in Huntsville, Alabama. In the fall, he will speak at numerous events, and will present a clinic at the Midwest Band and Orchestra Clinic in Chicago. The Blugold also has a few things on his calendar that might impress even his middle school students. Rumor has it, Gleason says, he will be throwing out the first pitch at a Milwaukee Brewers baseball game this summer, and in January 2018, he and the other state Teachers of the Year will be honored during halftime of the NCAA National Football Championship game. In past years, state winners were named in the fall, with the national winner selected in the spring. Organizers tweaked the schedule this year, so the 2018 state winners already have been announced. Gleason, whose tenure as Wisconsin Teacher of the Year continues through December, says the change will allow him to mentor the newest state winner. While the White House visit likely was a once-in-a-lifetime experience, the relationships he’s formed with other state winners will shape his teaching and thinking about education well into the future, Gleason says. Gleason, who credits UW-Eau Claire with helping him turn his passion for music into a rewarding career, hopes to inspire more Blugolds to pursue teaching careers. “I am just very grateful,” Gleason says. “Grateful to be given an opportunity to advocate for our profession. Grateful for a supportive school district who fights to teach the whole child. Grateful for the education I received at UWEC. Grateful for the amazing teachers who show up every day and pour every ounce of their being into their teaching for the benefit of students." 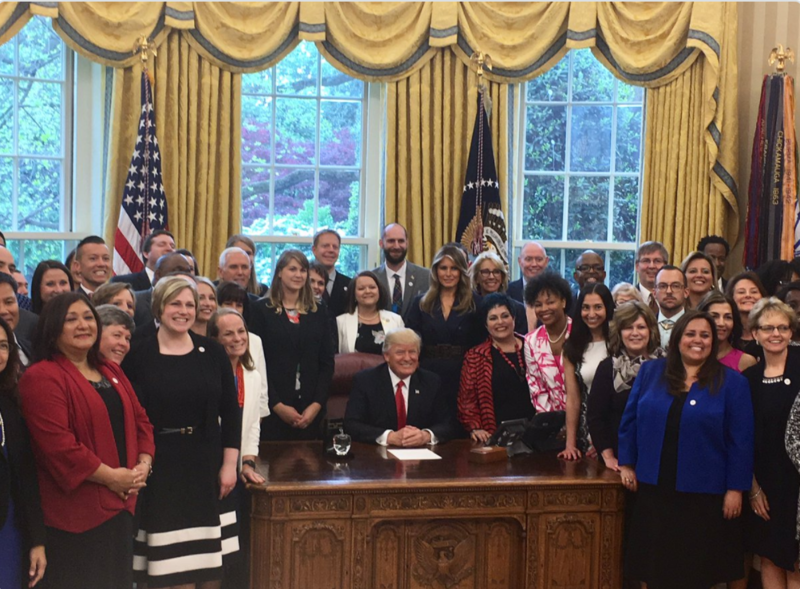 Photo caption: Chris Gleason and other state Teacher of the Year winners visited the Oval Office in the White House this spring during a series of events in their honor in Washington, D.C.